First of all, the great and different thing about the Brisket being "Corned" is that it's already seasoned, so you don't have to put much on for seasoning. Open white package near the pan you're going to cook the Corned Beef in so you can put the juices right in the pan so you don't lose the juice from the "corning" process. 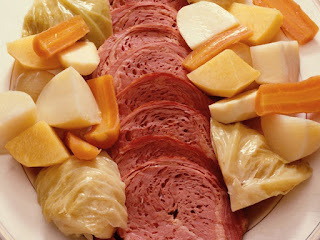 Put Corned Beef in pan and cover with Water until the Beef is covered. Add Cabbage, Potatoes and Carrots around the roast and cover with cut-up Onion. Bake in oven tightly covered for 5-6 hours at 275 degrees. Slice Corned Beef and put on plate with Carrots and Cabbage and enjoy!